FOXBOROUGH, MA—As the once-invincible, still-insufferable Patriots attempt to come to grips with their 17-14 Super Bowl loss to the Giants, the death of their dream to go undefeated, and the possible end of their dynasty, almost every other person in America is reveling in what they consider the perfect ending to New England's season. "I just couldn't imagine a better ending to the Patriots odyssey," said Simon Williams, a Kansas City-area football fan who usually watches the college game but found himself caught up in the Patriots' sheer loathsomeness during the season. "The utter lack of humility they displayed alongside an equal lack of any joy in the game, that toad of a coach, and that cologne-ad quarterback… If they have to act that badly while playing that well, you really want to see them fail in the biggest way possible. Thank God almighty, that's what we got." There is general agreement that the Super Bowl, despite the low score, was one of the finest in recent memory, due in part to the fearsome performance by the Giants and a cool, courageous display of quarterbacking by Eli Manning. 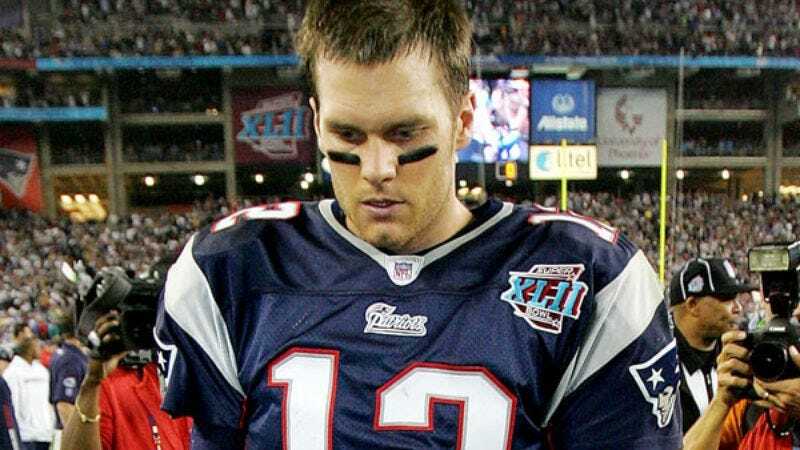 However, when asked about their favorite parts of the game, most fans chose the Patriots' cocky decision to begin the game with a trick play, which the Giants stopped handily; Bill Belichick's smug third-quarter attempt at a fourth-and-13 conversion, which blew up in his face, instead of trying a field goal; and New England's offensive line, which featured three Pro Bowlers, allowing high-cheekboned, doe-eyed, supermodel-impregnating passer Tom Brady to be hit over 20 times during the course of the game. "Did you see [Giants defensive tackle Jay] Alford smack Brady right in the face on that last drive?" said Bellvue, WA newsstand operator Christian Dansby. "Brady was almost offended. I think he forgot for a few months there that he was a football player. It was just perfect." "God, seeing Randy Moss do his weird chicken-wing crowd taunt when they scored to go ahead in the fourth was awful," said Jeff Lafferty, who watched the Super Bowl with rabid New England fans despite having known them for years. "What's worse is that the Pats fans ate it up. Of course, when Burress made that catch to win… Perfection. That's the only word for the Pats now. Perfection." However, most fans gave responses that had little to do with the game itself and more with the almost flawless joy of seeing the Patriots lose, as a team that has been insufferable and unappealing in victory instantly became inconsolable and self-pitying in defeat. Frequently mentioned examples of instances which, upon reflection, sweetened the Patriots' utter failure included the team's propensity to complain about unfair officiating after their victories; their habit of gleefully running up the score, which also resulted in Brady and Moss earning NFL single-season scoring records in blowouts; and of course, the players' and coaches' hateful attitude. "Come on, that cheating scandal to open the season and all they say is 'Everybody does it?' They could have at least acted a little bit sorry," said Milwaukee architect and sports fan David Engel. "They acted like a bunch of third-graders, just the way Belichick did when he ran off the field with time left on the clock. At least he shook the other coach's hand this time. That's a first for the big baby." "The worst part for me is that none of them seem to enjoy playing football," said Lexington, KY-area mechanic Jack Colgrave. "Even when they were winning, all they did was taunt—Randy Moss taunting crowds, Wes Welker telling people they sucked, Brady sneering at the very idea they might get beat someday. What a bunch of absolutely perfect assholes." "Did their team plane land safely back in Foxborough?" Colgrave asked. "It didn't happen to lose altitude over Boston, burst into a cartwheel of flames, throwing players like Roman candles across New England, and then slam into few dozen loudmouth Patriots' fans houses? It didn't? Well, I guess no football season is perfect."